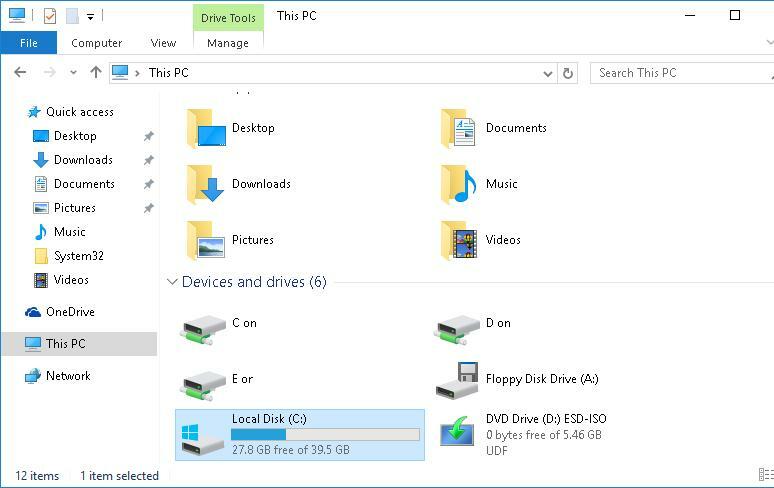 Windows 10 has a new function allowing to reduce the disk space taken by the system. The new function is called Compact OS and is an evolutionary development of WIMBoot technology implemented in Windows 8.1 Update 1. Compact OS allows to reduce the disk space occupied by the system due to compression of system files (like wim-file compression in WIMBoot). System files as well as preloaded Windows-applications files are compressed. Compact OS allows to save around 1.5Gb disk space on 32-bit and about 2.6Gb on 64-bit Windows 10. The technology is intended first of all for owners of tablets, smartphones and laptops with low capacity SSDs. After the compression, decompression file system is performed in memory on the fly, completely transparent to the system and applications. According to the Microsoft, Compact OS feature allows you to save disk space without a large drop in system performance. You should understand that saving disk space using file compression reduces the system performance as it has to use additional processor and RAM resources to decompress the compressed files. Let’s look at the Compact OS technology at work. So, there are 27.8Gb on the C:\ drive before the compression. 35401 files within 16674 directories were compressed. 5,309,743,895 total bytes of data are stored in 3,151,044,232 bytes. The compression ratio is 1.7 to 1. The compression will take some time, about 10-20 minutes. After the compression is over, compression ratio (1.7 times) and the value, by which the system files have been compressed, (in our example 5.3 GB were compressed to 3.1 GB) will be shown. Thus, additional 2.71 Gb of the system disk space have become available. At first site, there are no problems with the loss of the system performance.